Media say, the U.S. may or may not kill a number of North Koreans for this or that or no reason but call North Korea ‘the volatile and unpredictable regime’ –b. BEIJING, March 8 (Xinhua) — China proposed “double suspension” to defuse the looming crisis on the Korean Peninsula, Chinese Foreign Minister Wang Yi said Wednesday. North Korea justifies its nuclear program as the economically optimal way to respond to these maneuvers. 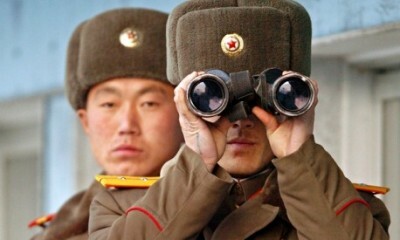 Each time the U.S. and South Korea launch their very large maneuvers, the North Korean conscription army (1.2 million strong) has to go into a high state of defense readiness. Large maneuvers are a classic starting point for military attacks. The U.S.-South Korean maneuvers are (intentionally) held during the planting (April/May) or harvesting (August) season for rice when North Korea needs each and every hand in its few arable areas. Only 17% of the northern landmass is usable for agriculture and the climate in not favorable. The cropping season is short. Seeding and harvesting days require peak labor. After decades of emphasizing military strength under his father, Korea is moving toward Kim’s “byongjin” — a two-pronged approach aimed at enhancing nuclear might while improving living conditions. What are the sources of [North Korea’s economic] growth? One explanation might be that less is now spent on the conventional military sector, while nuclear development at this stage is cheaper—it may only cost 2 to 3 percent of GNP, according to some estimates. Theoretically, byungjin is more “economy friendly” than the previous “songun” or military-first policy which supposedly concentrated resources on the military. Imperial Japan occupied Korea from 1905 to 1945 and tried to assimilate it. A nominal communist resistance under Kim Il-sung and others fought against the Japanese occupation. After the Japanese WWII surrender in 1945 the U.S. controlled and occupied the mostly agricultural parts of Korea below the arbitrarily chosen 38th parallel line. The allied Soviet Union controlled the industrialized part above the line. They had agreed on a short trusteeship of a united and independent country. In the upcoming cold war the U.S. retracted on the agreement and in 1948 installed a South Korean proxy dictatorship under Syngman Rhee. This manifested an artificial border the Koreans had not asked for and did not want. The communists still commanded a strong and seasoned resistance movement in the south and hoped to reunite the country. The Korea War ensued. It utterly destroyed the country. 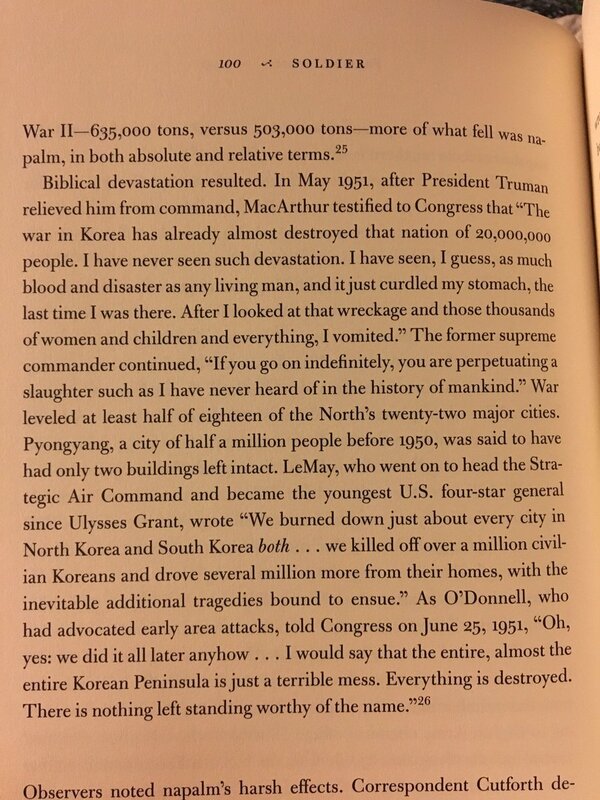 All of Korea was severely effected but especially the industrialized north which lost about a third of its population and all of its reasonably well developed infrastructure – roads, factories and nearly all of its cities. Every Korean family was effected. Ancestor worship is deeply embedded in the Korean psyche and its collectivist culture. No one has forgotten the near genocide and no one in Korea, north or south, wants to repeat the experience. The country would reunite if China and the U.S. (and Russia) could agree upon its neutrality. That will not happen anytime soon. 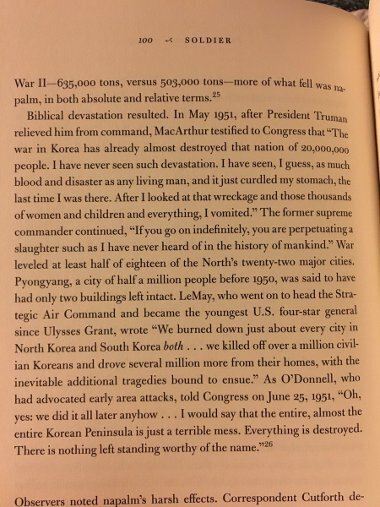 But the continued danger of an “accidental” war in Korea would be much diminished if the U.S. would accept the North Korean offer – an end to aggressive behavior like threatening maneuvers against the north, in exchange for a verified stop of the northern nuclear and missile programs. 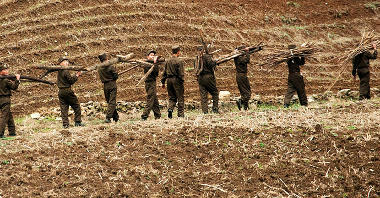 North Korea has to insist on this condition out of sheer economic necessity. The U.S. government and the “western” media hide the rationality of the northern offer behind the propaganda phantasm of “the volatile and unpredictable regime”. But it is not Korea, neither north nor south, that is the “volatile and unpredictable” entity here. Yesterday’s Day of the Sun / Juche 105 (the 105th birth anniversary of Kim Il-sung) parade in Pyongyang went along without a hitch and without interference from the U.S. side. Several new types of missile carrying Transporter-Erector-Launcher vehicles (TELs) were shown. The three hour TV transmission is available here. The military equipment display starts around 2h14m; the nuclear capable carriers are seen from 2h20m onward. Even though Pyongyang withheld from testing this weekend amid rumors of possible retaliation by the United States, North Korea is still looking to improve its missile know-how. Moreover, the long-dreaded ICBM flight test also might not be too far off now. Given the ever-growing number of TELs — both wheeled and tracked — North Korea may soon field nuclear forces amply large that a conventional U.S.-South Korea first strike may find it impossible to fully disarm Pyongyang of a nuclear retaliatory capability. That would give the North Korean regime what it’s always sought with its nuclear and ballistic missile program: an absolute guarantee against coercive removal. The “absolute guarantee against coercive removal” would, in consequence, allow for much smaller conventional forces and less resources spend on the military. This again will enable faster economic development for the people in North Korea. The byongjin strategy will have reached its aim.